Still digesting everything Apple announced at its massive WWDC 2017 event this week? We've got one more for you, though this bit wasn't trumpeted from the keynote stage. As reported by 9to5Mac, Apple's wireless AirPods headphones will automatically sync with Apple TVs running tvOS 11. This is significant because it further integrates one piece of proprietary Apple hardware with another. Previously, if you wanted to tune into your Apple TV using AirPods, you had to pair them just like you would any Android headphones. While not a complicated process, it was a few extra steps you didn't need to take with other Apple hardware. It's important to note a few things. First, AirPods will only automatically sync when you have an Apple TV connected to an iCloud account. Your AirPods, naturally, must be synced to an iPhone with the same iCloud credentials. What's more, right now only one iCloud account can connect with tvOS 11. That means if you have an Apple TV used by multiple people, any AirPods will have to go through the manual link-up process. 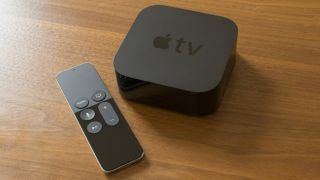 Look for tvOS 11 to launch in public beta later in June (it's already out in developer preview). In the meantime, check out iOS 11 and find out how you can download it right now.